What a view! 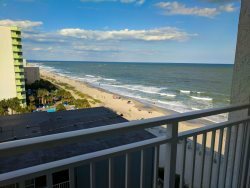 If you're looking for an incredible vacation rental on the beach, this 20th floor apartment at the Palace Resort will not disappoint. This is a 2 bed, 2 bath, fully furnished apartment located at The Palace Resort in Myrtle Beach, SC. Sitting atop the 20th floor, this unit offers 2 private balconies that boast endless Northern views of the Atlantic Ocean. The skyline view of Myrtle Beach at night is breathtaking! This apartment will comfortably accommodate 6 guests.Both the master bedroom and guest bedroom have queen beds and private balcony access. In the living room, 1-2 additional guests can be accommodated on the queen sleeper sofa. All towels, linens, bedding, and toiletries are provided, so be sure to pack light! Each room has 50 inch smart TV's and our guests will be able to enjoy streaming channels such as Netflix, Youtube, Sling, and other popular apps! The kitchen is fully stocked with all basic cookware and necessities. Our guests enjoy the ocersized kitchen, full-size fridge, pantry, dishwasher, stove/oven, and an abundant amount of counter space and storage. While these apartments at The Palace do not have washer and dryers, there are coin-operated machines on every other floor at the resort. Our guests will also be able to enjoy amenities at The Palace. This includes outdoor pools, hot tubs, free parking, and beach access. As of March 2019, all furniture is brand new! The Palace Resort is currently completing an exterior project that will take place until the end of April 2019. Our oceanfront balcony is complete and you will have access to it. However, our city view balcony is currently being worked on. Guests will not have access to it. There could be noise and odors that affect your stay. Pools and amenities may also be affected. If given advance notice, we may be able to give you pool access to another place. We apologize for any inconvenience but because you are being forewarned, there will be no refunds given. Our prices are already marked low due to this. Breakfast: Our guests can enjoy breakfast for $9 per person on site overlooking the ocean (seasonal). Water Features: There are 2 oceanfront outdoor pools! One of the outdoor pools becomes indoor in a small area (see picture). There are indoor and outdoor hot tubs! Other Amenities and Entertainment: Several on site amenities such as a small putting green, arcade, sauna, steam room and convenient vending machines throughout the resort. Free Wireless Internet: There is free Wi-Fi so you can stay connected without using your phone data! Guest Laundry Facilities: There is a laundry facility (coin machine operated) on the 22nd floor that you are free to use.